BMX stands for bike motor cross and as such reflects the close association and similarities with the sport of Motor Cross. BMX racing is a structured sport that takes place at purpose built venues across the country. It is different from BMX freestyle riding which belongs to an alternative youth culture and similar in nature to skateboarding and inline skating. What are BMX play tracks? Play tracks are smaller versions of the traditional racing tracks. They aim to provide for basic jumping and skills practice as well as introductory circuits and can be used by all types of bicycle. Play tracks are adaptable with regards to size and shape and can be built to suit a given space or budget. They are constructed from clay based sub soil with a rough surface for traction. Why build BMX play tracks? Address the inequality of provision for informal recreation facilities between children and young people. Have a positive effect on the health of young people by encouraging them to lead a more active lifestyle. Have a positive impact on the level of crime and antisocial behaviour associated with young people. Improve the social cohesiveness of rural communities and by reducing inequalities also meet the aim of Local Agenda 21 by including local people in the development of social, economic and environmental sustainability. Provide a safe, exciting and challenging place for both boys and girls to ride their bikes. Support the British Cycling's current Facility Strategy for the development of facilities as a means of recruiting young people into (sport) cycling. Are environmentally friendly being principally constructed from clay based sub soil otherwise destined for landfill. Have a low capital and maintenance cost compared to other facilities. It is clear that cycling is a popular activity amongst young people. The National Survey of Young People and Sport in England 1994 found cycling to be the second most popular sport amongst children aged 6-16 years. However, there are currently very few facilities for young people to ride their bikes on other than the roads. South Somerset has very few off road routes available to cyclists such as bridleways and RUPP's. These only make up approximately 10% of the rights of way network compared to the national average of 30%. It is estimated that in the UK BMX bikes account for about 10% (200,000) of the total UK market each year. These figures would suggest that young people have a larger demand for facilities that cater for mountain biking and BMX riding than for road racing. As part of the 'Facilities For Young People' project in South Somerset young people between 8 - 16 years were asked to choose which new informal recreation facility they would most like to see in their parish. Examples were given of facilities including multi use games areas, skating areas, BMX play tracks and youth shelters. They were also invited to suggest their own ideas. 1,501 questionnaires were returned from young people living in parishes participating in the project. BMX play tracks were the second most popular choice with 514 votes compared to multi use games areas 547, skating areas 404 and youth shelters 233. The results are shown in the table below. As a result of this survey South Somerset District Council is happy to support the development of 11 BMX tracks by parish council's and other groups on recreation grounds. The 11 proposed tracks will form a pyramidal hierarchical network with 9 being small local facilities (Option 1) while 2 will be larger neighbourhood facilities (Option 2) and act as a focus for organised activities such a races and training sessions. These activities will be organised by the local District Council Sport and Leisure Officer. Depending on the level of demand a larger District facility (Option 3) is planned which would serve as a club venue and host interclub competition. 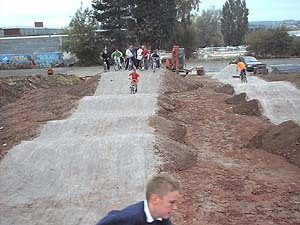 The smaller BMX play tracks (Option 1) play an important role in this structure by stimulating the demand for organised activities and a club as well as addressing social issues.